Printed in Practical Homeschooling #13, 1996. 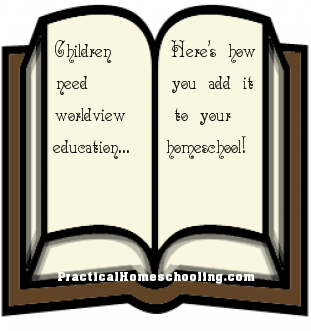 Cathy Duffy explains how to add worldview education to your already busy homeschool curriculum. In 1990, in our neighboring city of Anaheim, California, AIDS activists handed out condoms to eager teens in front of their high school. School officials, observing what was occurring, were only concerned that "activists stayed on the sidewalk and didn't block traffic . . . " One teenage condom recipient remarked, "They know we're going to do it anyway, so why not give us some protection?" Josh McDowell and Bob Hostetler, in writing their new book Right From Wrong, found that casual regard for truth and falsehood and inability to identify right and wrong characterize a majority of today's young people, including those who have grown up within the Church. Statistics such as those from a 1989 Gallup poll report, "Cheating is rampant in high school and college . . . about 75 percent of high school students admit to cheating, while about 50 percent of college students do." Still, we are shocked when we also discover, as did McDowell and Hostetler, that 66 percent of "Christian" young people lie to those in authority. Most Christian home educators find such attitudes shocking or dismaying because they so clearly violate God's law. We sometimes fail to realize that many folks now consider basing ethics and morality on God's law backwards and ignorant. We even find "Christian" churches that teach a form of self-centered, psychological morality that substitutes man's rationalizations for God's truth. Unfortunately, many Christians have been confused by the messages of media, schools, society, and government which have overwhelmed the voice of Biblical authority. The Biblical Christian worldview which prevailed in our country two centuries ago has been discarded or perverted so drastically that few even recognize what that worldview might be. A worldview should provide a coherent and consistent foundation for life. From that worldview we should be able to develop beliefs, positions, and attitudes about all areas of life. While there are numerous contending worldviews, only one delivers a coherent, consistent, and true foundation. The Bible provides the guidelines by which Christians should form their worldview. It tells of the sanctity of life which informs our positions on abortion and euthanasia. It reveals God's heart about sexual relationships, thus dictating positions on fornication, adultery, and homosexuality. From the Bible, we learn that God is a God of order who created the universe; thus we search for God's order in science rather than relying on "fortuitous chance" to explain the workings of nature. Since Scripture is the foundation for a Biblical Christian worldview, those who reject the Bible use other sources to validate their belief systems. If we want to convince others of the correctness of our position, we will be much more effective if we also understand the worldviews which are influencing them as well as their sources. In fact, part of developing a Biblical Christian worldview should be examination of other possibilities. However, keep in mind that we must first know Truth before we can identify Untruth. We like to think that truth is obvious to everyone, but we overlook the fact that people do not purposely choose to believe something they think is stupid or unbelievable. They have what they think to be legitimate reasons for their beliefs (although those reasons will usually reveal contradictions or faulty reasoning on some level of examination). When we discuss an issue with someone on the other side of the fence, the bottom line is usually not the issue itself, but the worldview that informs our opinions. For instance, many people view man as nothing more than a highly-developed animal. Consequently, they assume that each man answers only to himself. Since they do not believe in an afterlife, they must do all they can to make their "stay on earth" as enjoyable as possible. So, of course, it makes sense to abort babies who will cramp their lifestyles or interfere with their developing careers or irritate (and possible scare off) their live-in lovers. The bottom-line issue is the purpose and sanctity of life, while abortion rights and choice are side issues. So what does this have to do with home education? Ideas result in actions; generally speaking, bad ideas result in bad actions and good ideas produce good actions. The mess facing our society developed naturally from belief in, and action based upon, bad ideas about God, man, man's relationship to God, the family, government, and all other areas. For instance, Adolph Hitler believed the Aryan race to be superior to all others. He believed that inferior races and "damaged" Aryans such as the retarded, the ill, and the elderly were a drain on society. Therefore, it was his duty to eliminate those problems. His actions represented a natural outworking of his belief system. In a similar fashion, handing out condoms to teenagers and giving them the message that we know restraint is impossible is a result of the belief that men are no more morally responsible than animals, nor are they capable of self-control. Cheating, too, can be justified if we place morality on a relativistic plane. The usual excuse is, "It doesn't hurt anyone else, so it's up to me," which denies man's subjection to God's authority. What ideas do our children believe about God and man? Have they begun to develop a Biblical Christian worldview that will guide them through life? "All teenagers go through a period of rebellion"
"If we all pay enough taxes, government can solve all of the problems of hunger and homelessness"
"God probably created the world, but he used evolution to accomplish His goal." What do our teenagers believe about such issues? Have we made a conscious effort to consider each area of study in light of God's Word? Most of us simply adapt the typical course of study that has been followed for years. We assume that by using Christian textbooks and including a Bible study course, we will have taken care of any philosophical problems. Unfortunately, it's not enough. How many of them will be as strong as Michael New, the serviceman who defied his commanding officers and the President of the United States when ordered to don a United Nations uniform and serve under a foreign commander? During his years of homeschooling, Michael studied God's Word and the Constitution. He understood right and wrong enough to challenge his superiors when they ordered him to transfer his allegiance and service to the United Nations against his will and his oath of service. What will our teens face when they complete high school? Few might end up on the front lines of the moral battlefield. Some will be able to continue their education at good Christian colleges, insulated from overt challenges for a time. Others will continue their education at colleges and universities where they will encounter both obvious and subtle challenges to their faith every day. Still others will move into the workplace, associating daily with people who follow all types of non-Christian belief systems. We must ask ourselves if we are equipping our children to, first of all, be able to stand firm in explaining their belief in Jesus Christ as Savior, and, second, be able to bring the precepts of Christianity back into positions of influence in all areas of life. Unless they understand how those areas of life are dominated by other belief systems, they certainly will not have any idea of what changes are needed. For example, Secular Humanists, denying the sin nature, believe that man can perfect himself and society. Consequently, they trust government solutions to improve people and fix social problems. In spite of massive evidence of the failure of such "solutions," they continue to expand their fix-it programs. It's as if they are saying, "If we just try harder, do more, and spend more money, we'll get it right." Secular Humanists deny the existence of a God who works within the hearts of men to do the fixing. However, they have a clear worldview system to follow (more government control and programs) and strong faith in their worldview, even though it never has worked. That's why they have accomplished so much more politically in the last century than Christians, whose political worldview has been confused or lacking. As far as I'm concerned, if our home education efforts produce young adults who do no more than cling to their own personal faith like a security blanket, we've fallen short. We should want them to be used by God. Thus, a major part of our effort should be spent in equipping them with a Biblical Christian worldview, and within that framework, teaching them how that worldview speaks to all areas of life. Teaching worldviews presumes that we already have a Biblical foundation upon which to build. We have to know truth before we can identify untruth. The Bible is our only certain source for truth, so a Biblical foundation must be in place before we set out to examine and challenge other belief systems. While many of our teens know a lot about God, some of them accept their faith on a superficial level. Worldview studies that include apologetics ideally should challenge them to examine the reality of their faith and question the evidence in their own lives. From that point, how we choose to approach worldview education will vary from person to person, depending upon our interest in and knowledge of different subject areas. Francis Schaeffer was very interested in the arts, so he developed his discussion of worldview based upon historical analysis of the changes in the arts. David Noebel has developed the Summit program with more emphasis on history and political systems, although he addresses other subject areas. History stands out as the common unifying subject for most in-depth study of worldviews. The flow of events and their results provide obvious evidence with which we can begin our study. From history we can build in any direction we choose - art, literature, philosophy, politics - going as far as we need. Worldview education overlaps many basic high-school subjects, sometimes making it a challenge to translate course content onto a standard transcript. You might simply treat worldview studies as a free-standing one- or two-year course and assign credit as you would for any other course (possibly calling it something general like "Humanities" or "Philosophy"). However, you might prefer to use it in conjunction with your other courses (e.g history, English, government, art), considering the worldview study as part of larger, more comprehensive studies being done with texts or other resources. For example, in our worldview class this year, the students will present a biographical speech and write a lengthy term paper. Work on these projects will contribute toward both history and English credits, and possibly others. Much depends upon how much time you devote to the different topic areas. In our family, I spend two years on intensive worldview studies, which translates into one credit for the worldview class itself plus partial credit toward history, English, and art. Since I want to spend a great deal of time on government and economics, also from a worldview perspective, that will be another, full-credit course. We began worldview education as a specific study with our two eldest sons (at ages 14 and 16) using a do-it-yourself approach. We worked within that framework for a year, then added the Summit Ministries' Understanding the Times curriculum the second year. Since we began, I have found other resources that make the task somewhat easier, although none is quite as easy to use as Understanding The Times. A good history book which discusses philosophical ideas and their impact on events is crucial. Excellent texts trace those ideas beyond their immediate time period, down through following generations. I have found Bob Jones University Press World History For Christian Schools most useful. It covers art, philosophy, world religions, literature, science, law, and politics (albeit briefly) fairly well. The discussion questions are the outstanding feature. Questions such as, "What motivated European rulers to either support or oppose the Reformation?," "What influence did Christians have on nineteenth-century Europe?," and "What impact did European society have on Christians?" extend thinking beyond the facts into the realm of belief systems. Next I developed unit studies with a worldview emphasis, by expanding on content in chapters or units in the history book. I also used a comprehensive time line, The World History Factfinder. (A similar book, The Timetables Of History, is more commonly available to home educators.) I looked through the time line for particular people, places, or events that would be helpful in developing worldview themes. I was also looking for relationships between ideas and events easily missed in history books. For instance, events on the "religious front" often had dramatic impact upon politics; the French revolution for example. The first year I placed varying amounts of emphasis on subject areas according to the time period being studied. For instance, when we began with creation and early history, biology (theories of origins) received more attention than it did in our unit on the Middle Ages. I then chose a variety of resources to use for each subject area. Building worldview studies around a history text, using only a few supplements from the family and local library, might be the extent of your course. However, we can do much more, expanding our studies in familiar subject areas (e.g., the arts, literature, science) or in directions which have readily-available resources. Because of my experience with Schaeffer's book, I incorporated art, music, and architecture. Our primary source for the arts is History of Art by H.W. Janson. This very large book follows a historical outline, tying in information from other subject areas where appropriate, making it a terrific resource. The abundant illustrations include most paintings, sculptures, and building referred to by Schaeffer in How Should We Then Live? The History of Art for Young People from the same publisher is an abridged but equally valuable substitute. In spite of the title, the content works for students at high school level or above. Cornerstone Curriculum Project's Adventures In Art provides a more thorough study of paintings described by Schaeffer. The first two levels in the Adventures in Art series help children to learn to observe art. The third and fourth levels move into the worldview applications, quoting frequently from Schaeffer and following his line of thought. Cornerstone's Classical Composers and the Christian World View serves as a companion to Adventures in Art and provides a worldview approach to the study of classical music. I have incorporated literature, the wonderful revealer of worldviews, throughout our studies. I chose a few of the influential authors from each historical period and read either excerpts or entire books. The selected readings were not all by Christians. By reading what our opponents have to say, we can better understand opposing belief systems. Reading an excerpt from Machiavelli's The Prince helped us understand the pragmatic attitudes of rulers of the Renaissance and after. (We probably see more pragmatism today than was evident four and five centuries ago!) We discussed Machiavelli's worldview and the conclusions he formed because of it. Sir Thomas More's Utopia, written twenty years before his conflict with King Henry VIII, described his vision for a perfect world. We watched the movie A Man For All Seasons about the later period of More's life and contrasted the evident changes in his philosophy. Luther on Education (a translation of two of Martin Luther's educational treatises) provided interesting reading. From his perspective, it seemed a good thing for government to establish state schools to ensure that children learned to read and become industrious. This led into a discussion of government's responsibility to its citizens and imposition of philosophical views through law. Sources for literature were often library books or anthologies (especially the various Norton anthologies) from thrift or used book stores. I have also found A Beka's Masterpieces From World Literature an excellent source for representative reading. Generally, I recommend works (excerpts are often acceptable) by the originators of ideas themselves rather than works that summarize or report someone else's impression of the original person or idea. I chose to spend even more time studying other philosophical/religious systems. While most history books address various religions and their origins, it helps to devote extra study to belief systems that have persisted through the centuries, such as Hinduism, Buddhism, and Islam. Many of these ancient religions have recently become popular in the United States, but go unrecognized under various New Age disguises. The teaching that there are many roads to God, characteristic of some of these, provides an important plank of the global, one-world government agenda promoted by our president and other influential people. These philosophical/ religious issues lie at the heart of our worldview study. By the time we have gone through other subject areas and raised questions that lead back to the origins of beliefs, students are ready to examine such fundamentals. We used a number of resources. Examples of some readily available resources are Gods of the New Age by Caryl Matrisciana (available in both book and video formats from Jeremiah Films), The Islamic Invasion by Robert Morey (Harvest House), The Search (video from Inter-Varsity Christian Fellowship of the USA which introduces New Age beliefs), and The Universe Upstairs by Merve Jones (InterVarsity Press), a "comic book" style approach to Christianity, deism naturalism, nihilism, existentialism, and New Age beliefs. A study of mythology may help here, because of the parallels between ancient and modern forms of polytheism and pantheism. Studying the past is helpful in developing a Christian worldview, but if we look only at the past and ignore the present, we overlook one of the purposes for even pursuing such study. Current events demonstrate the outworking of worldviews and certainly make the subject come alive for teens. Most of us see the results of anti-God worldviews in the school system, but few of us identify the same elements at work in our judicial or welfare systems. As we study worldviews, we begin to identify more cause-and-effect relationships. The newspaper provides bountiful examples of worldviews in action in all areas of life. Christian magazines, newsletters, or newspapers such as World and Focus on the Family Citizen serve well for those who cannot or choose not to subscribe to a secular newspaper. Conservative magazines such as Conservative Chronicle, although not exclusively Christian, often address current worldview issues. To cover current events, I collect articles and organize them by categories (e.g. creation science vs. evolution, government, ethics, secular humanism). I use large manila envelopes which I punch with three holes to fit into a binder. I began collecting these articles before we started the course, then I had them handy to share when we hit each topic. This served a double purpose, because it also taught the students how to read with discernment as they searched for their own articles. This sort of activity can begin even before you initiate formal worldview studies. When we added the Understanding the Times curriculum the second year, we continued our studies in history, art, and architecture, and we expanded literature studies. However, Understanding the Times filled in part of our studies for history, science, government, religion, and English, which saved me much preparation time. Understanding the Times is a video-based version of the two-week worldview program offered by Summit Ministries at their Colorado headquarters. Understanding the Times (UTT) divides worldviews under three headings: secular humanism, Marxism/Leninism, and biblical Christianity. (An appendix addresses New Age worldviews.) UTT then examines 10 areas or topics through each of the three worldviews. The 10 areas are theology, philosophy, ethics, biology, psychology, sociology, law, politics, economics, and history. The text for the course, which goes by the same title, allots equal time to each of these areas, but the video course follows a different format. There are over 30 tapes, most having two lessons per tape. Some topics such as creation/evolution and modern history receive much more attention than others. Other supplemental books and readings come with the course, and students each have a binder containing outlines for videos which they fill in as they watch. Although we began our worldview studies the first year with only our family, when we began the UTT course we added five other teenagers. Even those who completed only the UTT course showed tremendous growth in terms of meeting the Scriptural goals. This year we begin the UTT course again with a group of eight teens. I have chosen to alter the order in which I use some of the videos, and I have omitted some (particularly the Hells Bells section on rock music) and substituted a few others that I prefer. However, on the whole I am so impressed with the course that I think it should be offered to all Christian teens and parents. The catch is the cost, $1090, plus textbook ($17.50) and notebook ($12) costs for each student. This can be overcome by forming group classes. Alternatively, your church could invest in the videos for their library, or your support group could solicit donations to purchase the videos. To help us tailor UTT to our time and resources, Summit also breaks the course down into the Basic Teaching Package which includes the major course components plus three videos ($495), a video package of all other videos for the complete course ($595), a package of 10 selected videos (for $245), or individual videos. Although I like the UTT course, I realize that many of us will wish to pursue other alternatives. I've described some of what we did here, and I have reviewed many other possible resources we might use for worldview studies within Chapter Five of Christian Home Educators' Curriculum Manual: Junior/Senior High. If you are uncertain about tackling such a study, start small by using a history text and adding as many special topics as you can handle. A course on worldviews certainly involves extra effort, but consider the consequences if we ignore it. Our children become easy prey for those who can defend their worldviews. They will lack the knowledge to identify falsehoods and inconsistencies. When their college professor condemns Christianity as the greatest cause of war and death, they will not know enough to present the evidence of the millions more killed by atheistic systems. When Senatorial candidates promise to cut crime by sponsoring midnight basketball tournaments, they won't know to question their wisdom. When they are challenged, like Michael New, to deny their oath of allegiance, they will join the thousands of others afraid to affirm, "You have no right to require this of me." When it comes to influencing popular opinion in America, true Christians make up the minority. We arrived at this state of affairs because almost everything members of our society perceive to has been filtered through non-Christian lenses, distorting truth in such a way that we have become unable to even recognize some of the distortions. We fight in the midst of a battle of ideas, and our children will likely be called upon to participate in that battle. But they won't be able to if they are ignorant of the problems and their causes! Ignorance might even be deadly. Many non-Christians view Christians as negative thinkers who impede the progress of all mankind with their exclusivist and narrow interpretations of truth. The answer? Eliminate the source of negative vibrations (a.k.a. Christians). A number of non-Christian belief systems battle for dominance in our culture. The Christian belief system right now has the status of an "also ran." Christians must again make our voices heard, but before we do, we have to make sure we understand our own message.